Its relatively smaller size notwithstanding, the Jaguar was indeed billed as Fender�s new top-line guitar and was nothing if not feature laden. It had an offset body�distinct from the Jazzmaster�s offset shape�and featured separate bridge and floating vibrato units. And if the Jaguar�s distinctive shorter scale length and extra fret weren�t all that obvious on first glance, the sheer amount of chrome and controls were. And the Jaguar was nothing if not feature laden. A beautiful guitar, it had a Jazzmaster-like offset body (the two weren�t identical�the Jaguar�s upper horn was and still is sharper than the Jazzmaster�s), and like the Jazzmaster it had separate bridge and floating vibrato units. And if the Jaguar�s distinctive shorter scale length and extra fret weren�t all that obvious on first glance, the sheer amount of chrome and controls were. The Jaguar had the most elaborate circuitry of any Fender instrument. Although it and the Jazzmaster were dual-circuit guitars (lead and rhythm), the Jaguar�s lead circuit was more complex, with three slide switches on a chrome plate on the lower horn (compared to the Jazzmaster�s single toggle switch). The first two were on-off switches for each pickup; the third engaged a capacitor that served as a low-end filter, producing a more cutting treble tone (informally known as the �strangle� switch). The Jaguar�s rhythm circuit consisted of a single slide switch on the upper horn that delivered a more bass-heavy neck-pickup-only sound, with its own adjacent volume and inset tone wheels (all mounted to, of course, a chrome plate). With more controls than any other Fender instrument, the Jaguar had the most elaborate circuitry of any Fender instrument. 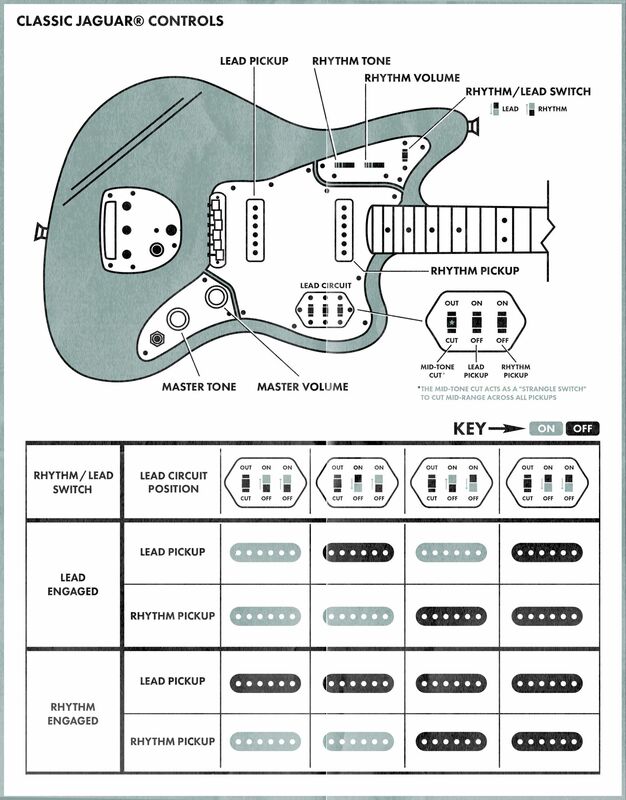 Although it and the Jazzmaster were dual-circuit guitars (lead and rhythm), the Jaguar�s lead circuit was more complex, with three slide switches on a chrome plate on the lower horn (compared to the Jazzmaster�s single toggle switch). The first two were on-off switches for each pickup; the third engaged a capacitor that served as a low-end filter, producing a more cutting treble tone (informally known as the �strangle� switch). The Jaguar�s rhythm circuit consisted of a single slide switch on the upper horn that delivered a more bass-heavy neck-pickup-only sound, with its own adjacent volume and inset tone wheels (all mounted to, of course, a chrome plate). The Jaguar was also the first Fender guitar to be offered with a variety of neck widths. Four options were designated A, B, C and D from narrowest to widest�standard, slightly narrower than standard, and two wider than standard. These options were also made available on the Stratocaster and Jazzmaster from 1962 on.